First, let me thank all of you who participated in last week's edition. All of your submissions were a joy to behold! 1. Any piece of photo art you choose. 2. A piece of photo art which you created using a layer mask. 3. 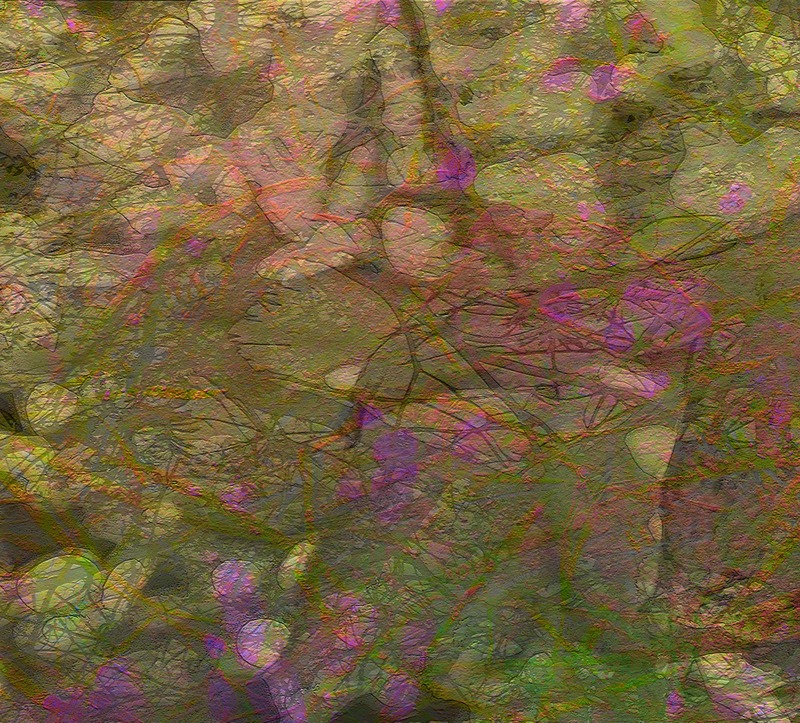 A piece of photo art that is not pretty. As we sat at a red light my eyes settled upon a lone figure sitting by an open window. In spite of the hustle and bustle at street level, I was captivated by this man in the window. He seemed to be sitting at a table eating. 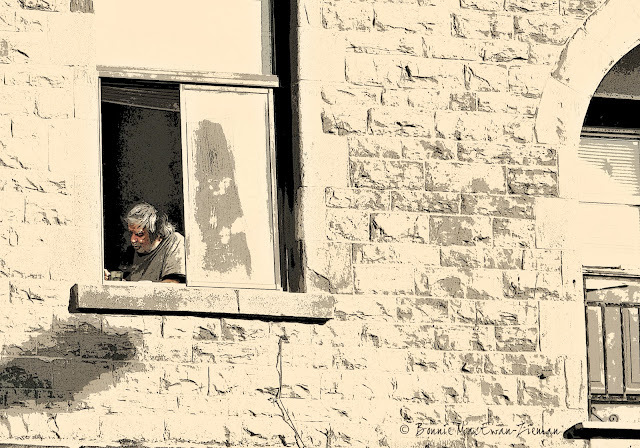 Was he was trying to make the best of his situation, choosing to dine 'al fresco' with the window wide open to catch the rays? As we tend to do, I constructed (completely fantasized) a story to go with what I saw. In the above photo, you see what I was able to see from my vantage point in the car. The photo was taken through the windshield glass. Intrigued by the figure in the window surrounded by cement, city grime, and noise ... curiosity aroused ... I moved in for a closer shot. Though concerned it was somewhat invasive taking his photo without his permission ... I persisted past any qualms and took the shot anyway. To ask his permission would ruin the moment and it wasn't really possible. Even closer now, I can see his beard, dishevelled hair, caved-in chest, hunched shoulders and green drinking goblet. Imagine the story this man would tell. That ... the story ... intrigues me more than the image. These photographs have not captured beauty, but they have captured a moment in time that is ripe and heavy with story ... the true details of which shall forever remain unknown to me. 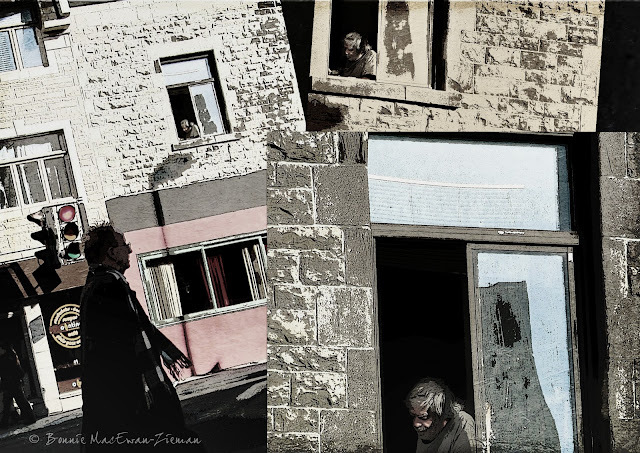 A collage of photos of the "Man in the Window". For next week's Photo Art Friday let's continue with having a choice of what to do, one of which will hopefully fit your inclinations and circumstances. 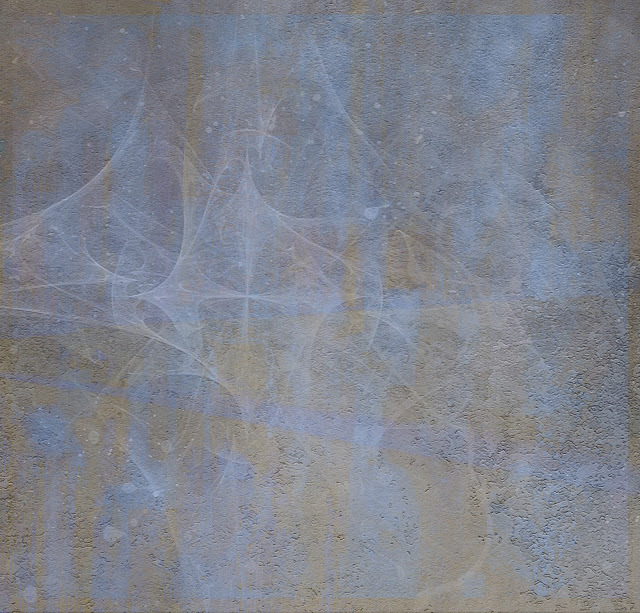 For your free download of pdpa Blue Moon texture, click HERE. For your free download of pdpa Dreams of Spring texture, click HERE. As always, our virtual gallery opens its doors early - Thursday evening at 7:00 p.m. EST. Bonnie, I love the second image here, and these textures are just gorgeous! Thank you for sharing them here, and for hosting. Your textures look so inviting. but it is too late over here for me to try them now. I shall have to wait till tomorrow.Thank you so much. Again. I go for no 1. :) I was looking at ice today. 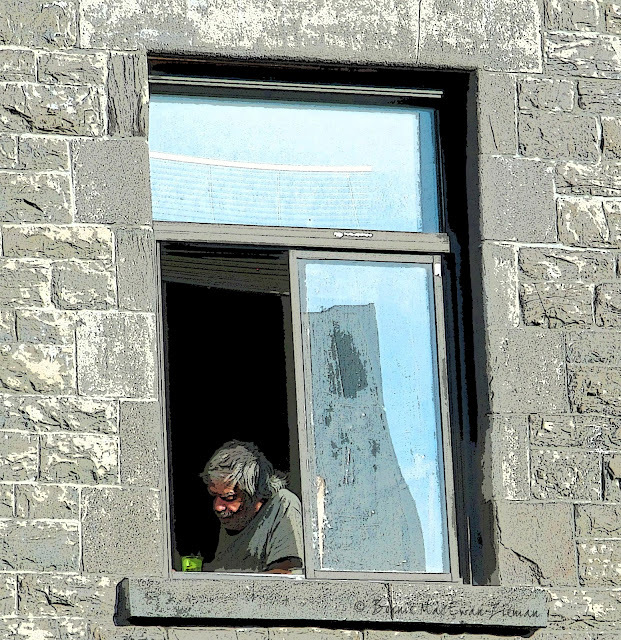 Oh, I just love your photos of the man in the window. You could even write a story called "The Man in the Window". The RadLab processing is wonderful. I'm wondering how you did the collage - Picnik has something like this, but they are going away very soon. I'll really miss them. Marilyn - Google's Picasa has many collage options. I will miss Picnik as well, so am using it as much as possible :). Bonnie this old disheveled man really fascinates me for some reason, and love how the "world outside" is passing him by. Very fascinating collage of pictures. Gorgeous work. I always stop by to see what you doing and dont always comment. I love your work. Brilliant. You are so inspiring. I love your collage and I'm intrigued by the man in the window. He looks so alone. I love how you've collaged the images into a "story"....Thank you for the beautiful new textures! I love these delicious abstractions, very suggestive. Greetings. I always enjoy viewing your work!! Thanks for the new textures! I really like the processing on your photos this week. Share what technique you used? because then I usually have something I can share! 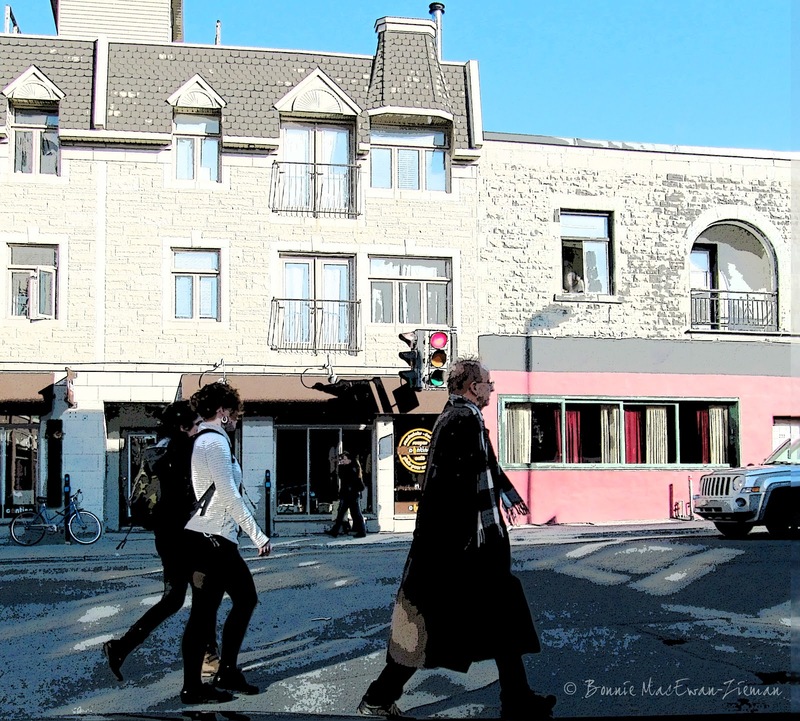 The image of the man in the window reminds me of when I was a child and rode the elevated with my Mom which would pass closely the windows of what I guess were rooming houses. In the summer the windows would be wide open, exposing the cramped room, a lone occupant wearing only a slip or boxer shorts, perhaps eating, reading a paper, or just looking back out the window. I haven't thought about that for years. Great image enhanced by the gritty quality of the texture. I love the play of light on the man's face. Bonnie these photo's are so intriguing. I love the way you processed them. They do make you stop and take a second (or even a third) look and you really want to know more about the man just by looking at the photos. I tried #3 but am not so sure I had the right idea after seeing your shots. Those new textures look fabulous, I'll have to give them a try. Thanks so much for offering them. I love how you processed these, there is something about that first image that I love, and the colors just pop! I really like the man in the window (# 2), amazing crop!!! This was a fun challenge! Papers are gorgeous. This is wonderful work, Bonnie. I really love the shots of the man in the window. I love that series of man in the window. Saludos. Great post-processing, especially I like the 2nd and 3th. Your man in the window I like very much. What in intriguing subject in the window. Although he is not pretty, he does make you think! Beautiful work!